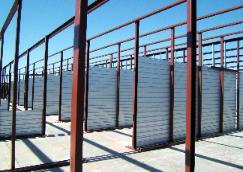 Gargoyle Steel Structures located in Lubbock TX, is one of the top rated self storage builders in Texas. With over 15 years in the Self Storage Construction industry we strive to be the best around. We have built self storage “mini storage” facilities all over Texas, New Mexico, Colorado, Oklahoma, and Louisiana. We have mastered the art of self storage design flexibility, which allows you to maximize site utilization for the best possible return on your investment. Our prompt service and attention to detail are just some of the reasons why Gargoyle Steel Structures is quickly becoming the #1 choice of owners, general contractors, and developers across Texas and the surrounding states. If you have considered building a new Self-Storage facility, or if you are looking at adding on another mini storage steel building, think about this, our buying power and design knowledge allows us to provide the lowest priced product with a quick delivery time. While most companies can take several weeks, even months to deliver complete plans, steel, and doors, our in house staff can have your engineered stamped plans in your hands in as little as one week. This allows you to save money and start renting sooner! Our self storage design of storage buildings are superior over pre-fab buildings because we custom design every self storage, mini storage, and storage facility to meet your needs, which allows you to get the most from your investment.